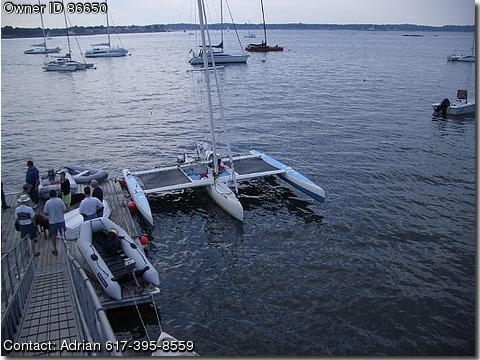 Please contact aweissma@yahoo.com to arrange to see the trimaran in Guilford Connecticut. 26' Long, 23' Wide Approximately 900 lbs fully loaded. Outriggers are carbon fiber, and main hull and cockpit is a combination of fiberglass and carbon fiber. Includes 5hp Four Stroke Honda Longshaft Motor, Tank. Includes Mainsail and Jib (Maintained by Kappa Sails) and roller reefing. Includes Harken Winches, and travelers. Includes custom made tiller and rudder kickup mechanism. Includes rather new Trailer, spare wheel. Includes Delivery on trailer anywhere in New England, willing to discuss other states, but will change the price slightly.